Do you know how the famous Chicken Tikka Massala was invented? Apparently no Indian chef has been able to claim it. Instead, it was first made in London, when a Bangladeshi chef added tomato sauce and spices to a Chicken Tikka to satisfy a diner who asked “Where is my gravy?”. Not sure if that makes it English or Indian and I’m undecided on whether that Londoner should go down in history as an ignorant diner or, in a sense, the father of the most popular Anglo-Indian dish. Possibly both. So where does one learn about Indian food? If the story about Chicken Tikka Massala is anything to go by, visiting a curry house is probably far from an authentic Indian experience. I’ve been trying to do a little bit of research on the internet but it’s not always easy to distinguish between traditional Indian food and a spiced up English stew. Having said all that, the first thing I’m making is a curry house favourite: King Prawn Puri. I’ve combined a few recipes off the internet, picking the best (i.e. easiest) bits from each one of them. 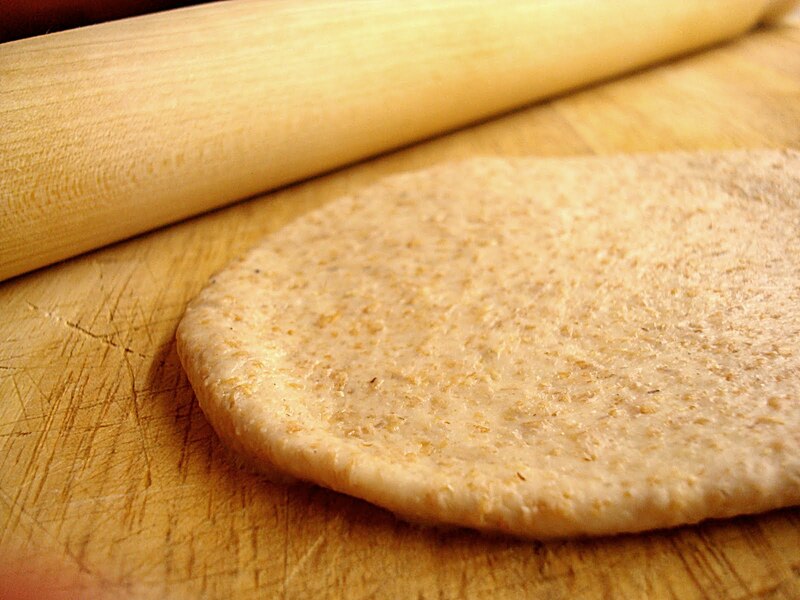 Mix the oil, flour and salt, and slowly add water to make a dough. Knead until smooth, place in a bowl and cover with a towel. Let it rise for about an hour. I find that it’s better to roll each one out as you go, rather than preparing them all first and then frying, as the dough gets quite sticky. 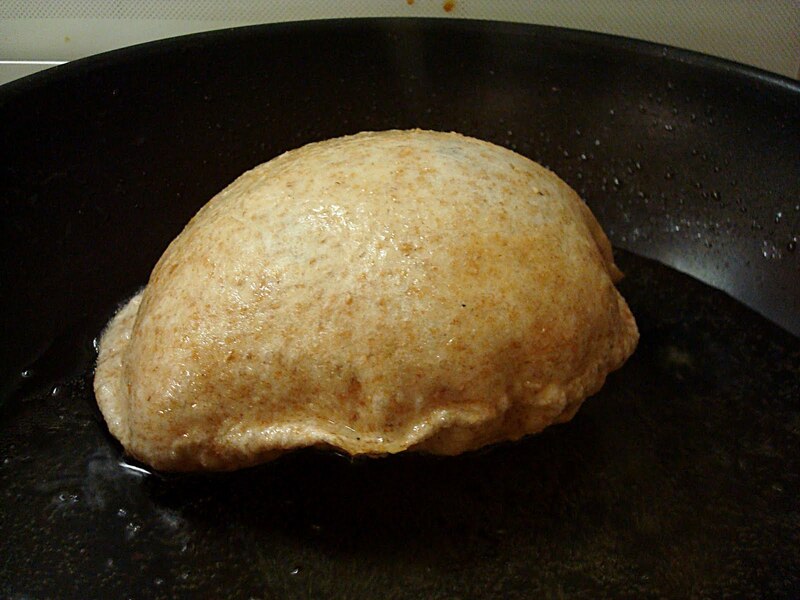 Heat some oil (or ghee) in a wok or some other deep pan and drop a puri in. It should puff up, either a little or possibly fully (the one in the picture is my most successful one, but they all tasted good!). They only need a few seconds on each side, do not let them brown or they’ll turn crispy. You want them cooked but still soft. Put each one on kitchen paper to get rid of any excess oiliness and prepare the next one. Heat the oil in a pan and add the mustard seeds. Move away from the pan and let them fry until they pop! Add onions and garlic and fry until soft. Add the rest of the spices, the prawns and when they are looking cooked (i.e. pink), add the tomato puree and some water to make it saucy. You don’t want too much liquid, but it shouldn’t be completely dry either. 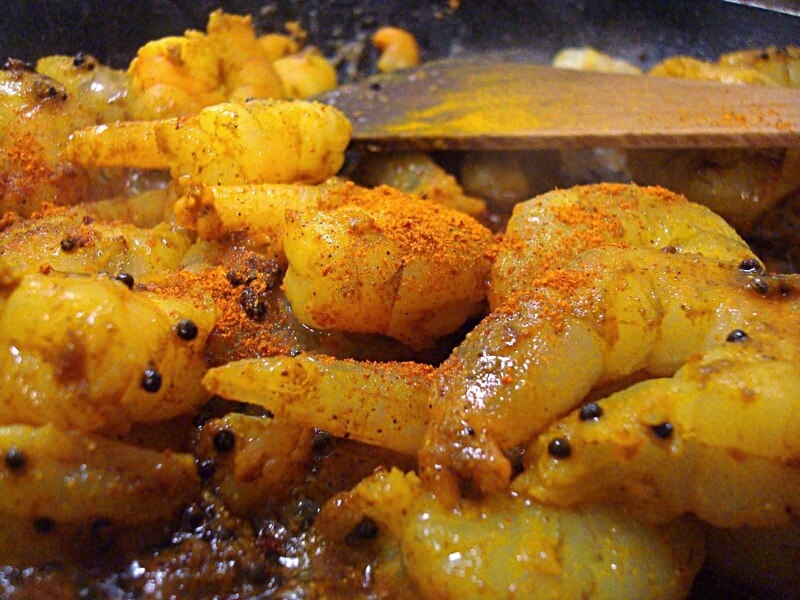 Cook for a few more minutes until the prawns are cooked through and the flavours are combined. 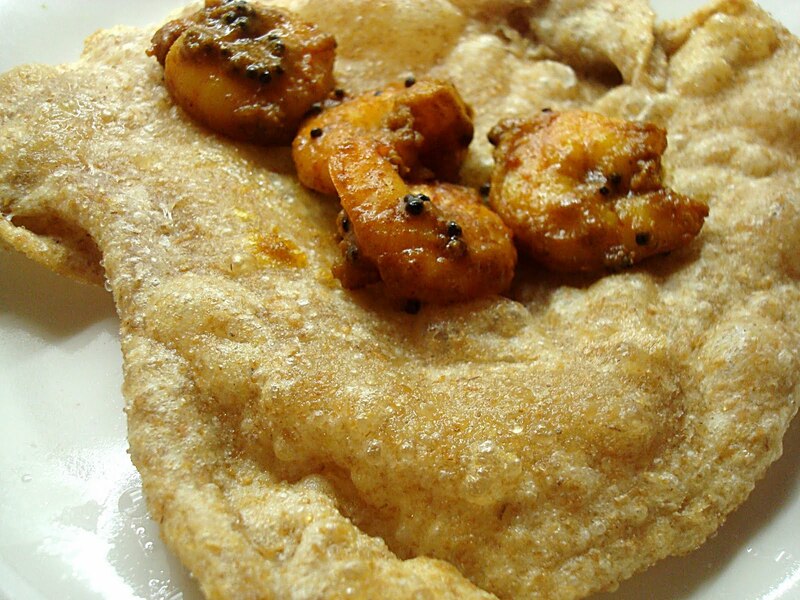 Serve each puri with some of the prawns and the sauce. I forgot the coriander leaves, as I was quite panicky with all the frying (big containers of hot oil scare me a little) but it was still very good. The puri is soft and chewy and perfect when combined with the juices of the sauce. I haven’t got any onion in mine as I had run out so I think it looks a bit drier than it should, but the flavours were brilliant. Serve with a squeeze of lemon: I love the acidity of it as it cuts through any oiliness that you get from the fried bread. Prawns and lemon are best mates anyway! I’ll therefore declare my first Indian dish a success, and move on to the next one with a lot more confidence! If you have any suggestions or tips or just some more knowledge on authentic Indian food, please leave a comment! Next time on Round the World in 100 recipes: My first Indian dessert! Tried this one out last night , Excellent ,almost the same as i get from the local takeaway. Really good receipe you can't go wrong!